Hi loves! ready for some super luxurious nails :-)? I wanted to wear OPI Miss You-Niverse again, also because I didn't show it to you guys yet, and decided to pair it with my 24k gold topcoat for a super chique finish. 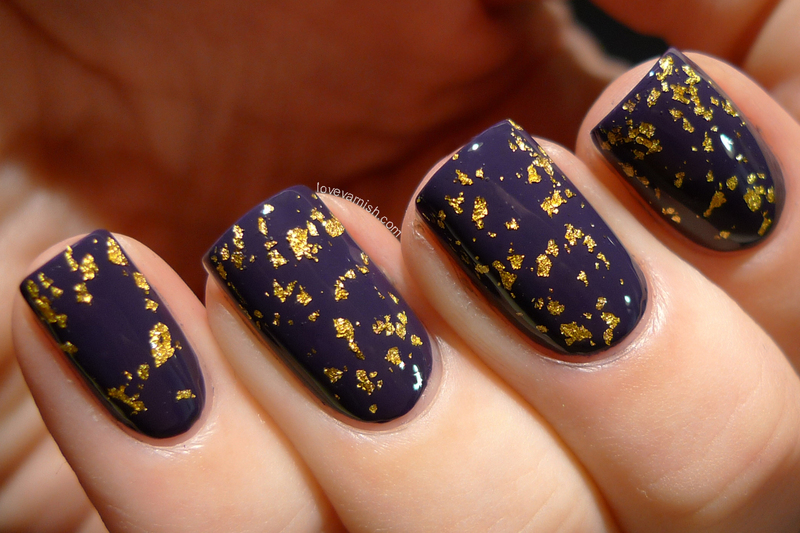 OPI Miss Yiu-Niverse is one of 3 shades from the OPI Miss Universe 2013 limited edition collection. This dark shade of purple has a great formula and it is opaque at ONE coat. That's right people! I love it when shades are like that. It has a buttery easy to handle formula and applies like butter. After it dried, I used my 24k gold topcoat to top it off - it has become a bit thick and that's why there is such an excessive amount of gold flakes. Still like it anyway ;-). What do you think of this combination? Love it as much as I do? Miss You-Niverse is so gorgeous!! Love the combo! Thanks so much Kellie, that means a lot to me :). It really is! I am so impressed by it even though it is 'just' a purple. Thanks Chiro! And yes, the Japanesque feel is there too :-). Yay, glad you caught the vibe :D! So preeetty! I definitely love it just as much as you do :-) I actually have a similar top coat from What The Flock. Thanks! Gold leaf topcoats are the best :). I used that same image the other day with a completely different colour scheme (gold and blue) and it also looked great. But yours is amazing... Such a stunning red for stamping!